Trump effectively blew what little cover he had left of being Czar Putin's Manchurian President, as he lavished praise on the Russian Dictator whilst deriding his own law enforcement and Intelligence agencies and their evidence of Russian interference in the 2016 Presidential Election, as Trump chose to side with Putin by following the Czar's script rather than the growing volume of evidence of Russian interference in the election that just days earlier had prompted the US to indict 12 Russian intelligence agents for hacking of DNC servers. That were a likely response to Trump's own statements made during the campaign for the Russians to to hack and leak Hillary's emails as he continued with the theme at the Press conference in Helsinki. "I think that the [Mueller] probe is a disaster for our country. I think it's kept us apart, it's kept us separated. There was no collusion at all. Everybody knows it. People are being brought out to the fore. So far that I know, virtually none of it related to the campaign. And they're going to have to try really hard to find somebody that did relate to the campaign. That was a clean campaign. I beat Hillary Clinton easily, and frankly we beat her, and I'm not even saying from the standpoint ... we won that race. And it's a shame that there could even be a little bit of a cloud over it. People know that, people understand it, but the main thing, and we discussed this also, ZERO COLLUSION ... "
You have groups that are wondering why the FBI never took the server -- haven't they taken the server. Why was the FBI told to leave the office of the Democratic National Committee? What happened to Hillary Clinton's e-mails? 33,000 e-mails gone -- just gone. I think in Russia they wouldn't be gone so easily. I think it's a disgrace that we can't get Hillary Clinton's 33,000 e-mails. So I have great confidence in my intelligence people, but I will tell you that President Putin was extremely strong and powerful in his denial today." "Yeah, I did hear these rumours that we allegedly collected compromising material on Mr. Trump when he was visiting Moscow. Well, distinguished colleague, let me tell you this: When President Trump was at Moscow back then, I didn't even know that he was in Moscow. I treat President Trump with utmost respect, but back then when he was a private individual, a businessman, nobody informed me that he was in Moscow." 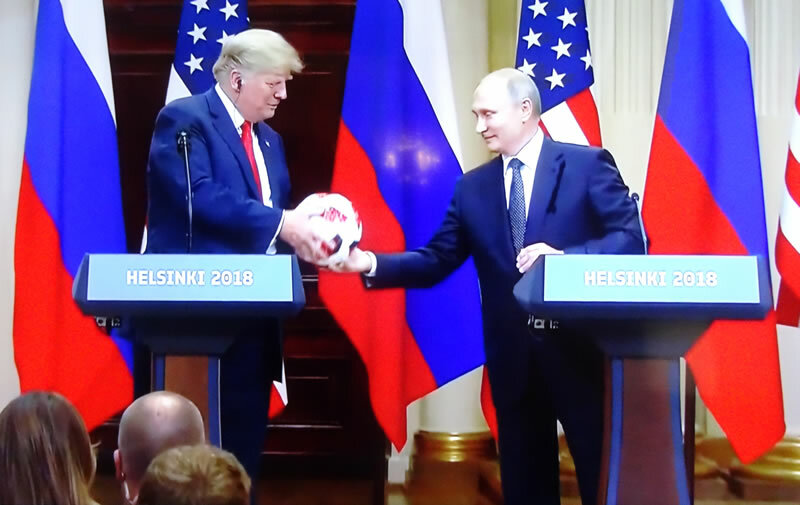 The unanimous reaction to the Trump Show in Helsinki was right across media spectrum from the establishment liberal media through to Fox News was one of how could the President of the United States side with an 'enemy' over that of their own intelligence and agencies. Hence an overt Manchurian President acting on behalf of Russian interests. "Well, I think we have a lot of foes. I think the European Union is a foe, what they do to us in trade. Now, you wouldn't think of the European Union, but they're a foe. Russia is foe in certain respects. China is a foe economically, certainly they are a foe. But that doesn't mean they are bad. It doesn't mean anything. It means that they are competitive." Trumps actions in office, are not just limited to the highly damaging trade war against America's western allies with whom Trump should be coordinating the Trade War against China, but his actions are undermining the very pillars on which the US Empire has stood for 70 years such as NATO. Which as I warned in December 2016 not only risks destroying the fundamentals of the US Empire but risks giving birth to new competitor Empires by unleashing the likes of Germany in Europe and Japan in Asia to re-arm and once more and embark upon their own military and economic agendas in the name of defence, where in Europe the emerging Fourth Reich (already in existence economically) would see the reason for its militirisation as a deterrence against a belligerent Russia as US guarantees could no longer be relied upon. Whilst in Asia we have Japan also re-arming due to lack of credibility of US military guarantees in deterrence of the ever expanding Chinese Empire. Though as these two NEW competing empires emerge and grow then undoubtedly they would seek to displace US influence in their regions, thus Trumps actions are splintering the world into multiple competing military and economic blocks as the United States empire remains primarily focused on the Chinese threat, thus turning a blind eye to the emerging threats of Germany and Japan that would once more see the western Pacific as Japan's back yard. Which is probably what a short-sighted Trump wants to happen because it means the US does not need to spend as much money on containing China as the Japanese would increasingly do the job, all without realising what Japan would do with its vastly expanded military. The consequences of dismantling of the US Empire and unpleasing Japan and Germany is clearly something that Trump completely fails to comprehend given his simplistic Fox News world view. 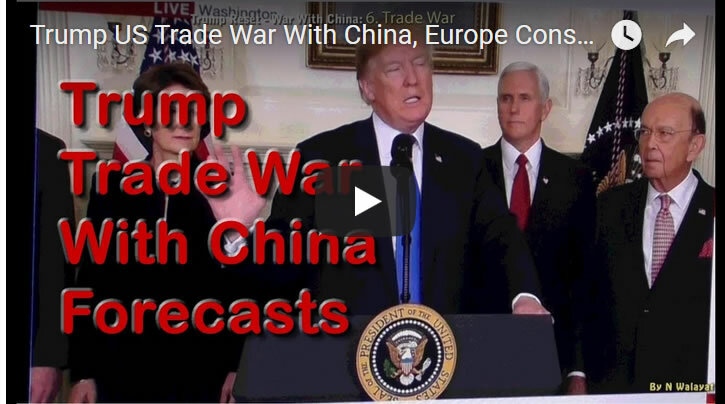 And comprehensive video analysis covering the implications of the unfolding US Trade War not just against China but much of the rest of the Western World. Furthermore I have been warning my readers before Trump took office that he would be at war with his intelligence agencies given the conflict of Trump promoting Russian interests over US interests due to the fact that Putin helped Trump get elected and with the so called "pee pee" tape hanging over him. The CIA has already effectively warned that Donald Trump is Putin's manchurian candidate as I covered in my extensive article (27 Dec 2016 - The Trump Reset - Regime Change, Russia the Over Hyped Fake News SuperPower (Part1) . So given the way things stand today, to imagine that a CIA death squad is not game playing the assassination of President Trump fly's in the face of the past 60 years of CIA history of worldwide and domestic slaughter. Where any perceived threat against the US establishment prompts extreme measures even of that threat is deemed to be from the office of the President of the United States. My warnings also extended to when Trump campaigned as Putin's Manchurian Candidate for President of how the Russians were desperately attempting to get Trump elected and why. 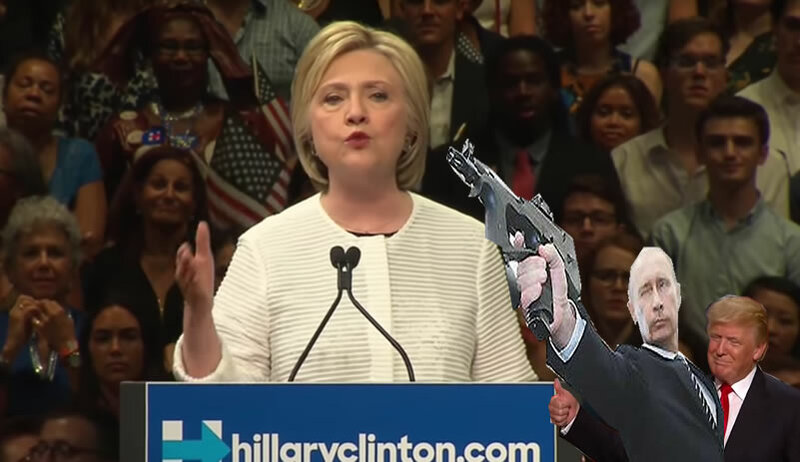 31 Jul 2016 - Putin Hacking Hillary for Trump, Russia's Manchurian Candidate?